We continue with the articles about Cheat Engine, but this time we will not use the PC version, but we’ll find out how to use the Cheat Engine app on an Android device that has enabled root permissions. If you already have an active root device, or you are willing to activate it (guides on how to enable it on your device, they are readily available from google) then go on reading, I’m sure you will find it interesting. We prepare the tools to use to use the Cheat Engine app. First download the Cheat Engine server called “ceserver”. There are several versions, x86 for windows and linux and ARM in the three 32-bit, 64-bit and ARM7 versions, choose the version based on your device, do not be afraid, even if you are wrong you can try it with another version until you find The right ones. Please note that the official website every now and then is down, if the link does not work try again later. On our device, after the previous step, we will have both terminal emulator and file manager. We run the file manager, you should get the root permissions automatically on the application, , if is not so, remember to activate it manually, and go to the download folder, usually you will find it in the storage of the main memory or the external SD card with the Download name. Look for the ceserver file you just downloaded, it will have a name like: ceserver_android_xxx. The file is a zip, unpack it by selecting the file with the long tap on the icon and selecting from the extended menu the “extract into” (or extract to) item by choosing the destination folder. Enter the folder you just created, select all the files in it and choose the copy command. Move to the system folder: system / xbin and copy the files inside. Change permissions to copied files so that they are executable. To do this, select them individually and choose the properties command from the extended menu. 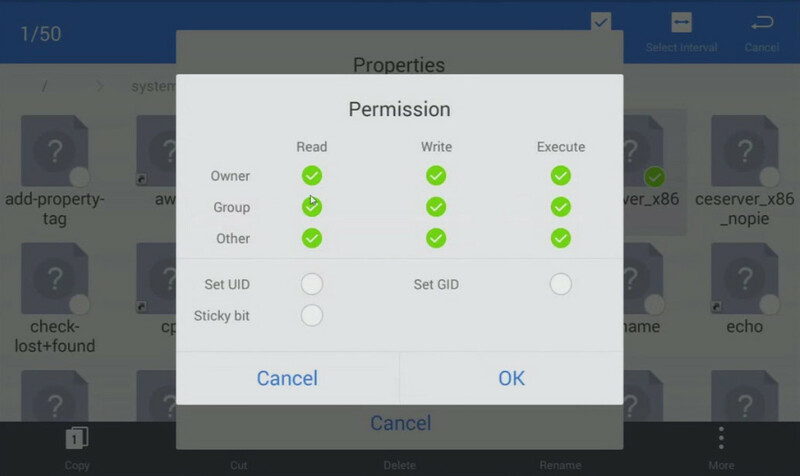 Choose permissions and select all read, write, and execute permissions for all levels (owner, group, and others). So far, we have configured the ceserver to be able to get started, we still have to install the Cheat Engine app and find out how to run it all. In the same download folder as above, the apk of the Cheat Engine app should also be present. Click on the file. You will be prompted to enable installation from unknown sources, proceed smoothly and the application will be installed on your device. The installation tool is complete. Now is the time to use the terminal emulator. Let’s go to the system folder where ceserver files were copied, that is, / system / xbin. Let’s go back to the main screen of your device, look for the Cheat Engine app and start it. You will be asked how to connect to the server, choose “Launch ceserver and connect locally (requires root)” and in the next step give root permissions to the application. You can do it both in a definitive way and only for the current run. The application is ready to be used on one of the games of our choice. For those who know the operation of Cheat Engine, it will not be a problem to figure out how it works on Android as cheat search is completely identical to the desktop version. However, the following provides a brief guide on how to use the Cheat Engine app. We have the game of our own interest. We identify a value that could serve us to create the cheat, such as money or experience points. We select the Cheat Engine app small icon that remains in semi transparency on the top left. The application will be started and you will be asked if you want to use the xxxxxxx process that matches the game you are playing with. Select the type of search to do, 4 bytes, 2 bytes, float etc, depends on the value you want to identify, in some cases eg though you see an integer actually being a decimal and you will not find it by searching for bytes, in this case the trick is to make several attempts, it may also be there that a value is not changeable because there is some protection system. On the contrary, it is difficult that you can not find the value you are seeing in the game because even in the worst case you should find the memory area where the value is simply displayed. 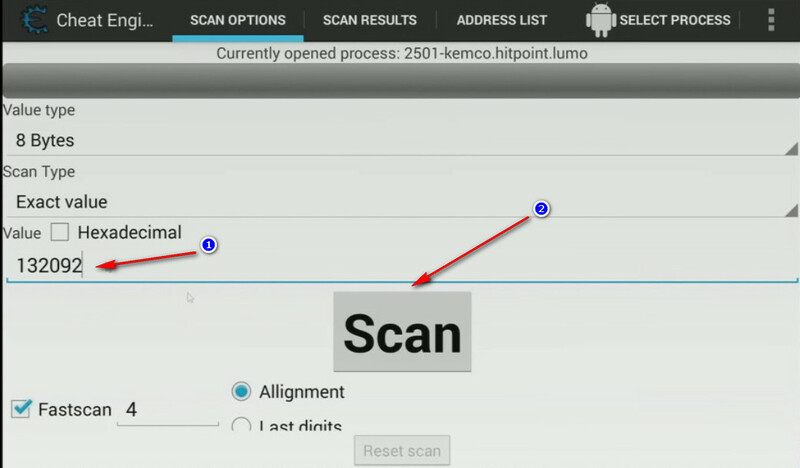 Start your search with “Scan”. You may find a single value at once, but it is very rare, usually proceed as follows. Go back to the game and make any action that changes the value of your interest. Click again on the semi-transparent Cheat Engine app icon. Enter the new value found in place of the previous one and start the search again with “Next”. Repeat the previous steps until you find one or more values in the address list. Make a long tap on one of the addresses of your interest, and add it to the “address list” from which you can change the value of the field. Open the “address list” section and you’ll find inside the addresses that you added earlier. Tap one of them and change the value, if the address found is correct and editable, this will have an impact on the game that will update the value with the one you entered. Use Cheat Engine directly the app on your Android device is certainly more immediate than using the desktop version of an emulator and then bring those changes on the physical device. However, not everyone loves changing their smartphone or tablet to give you root permissions for several issues that may arise. So the choice is for the reader to understand what is the best solution to use based on their needs. Let me know,subscribe to my pages and to my YouTube channel to keep you always informed and share if you found the article interesting. Help me to grow and keep the blog updated.